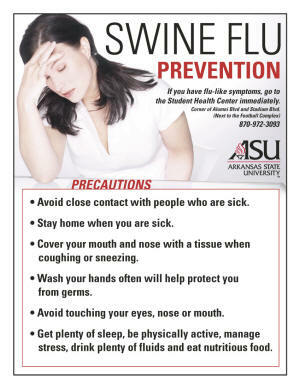 April 29, 2009 -- Arkansas State University officials are advising the campus community to take basic preventive measure s to guard against swine influenza and have listed precautionary good health practices that students, faculty, and staff should observe, as provided by the Center for Disease Control (CDC). If symptoms that are compatible with influenza should develop, students are encouraged to visit the ASU Student Health Center immediately at the corner of Alumni and Stadium Boulevards or to call (870) 972-3098. Students who are ill should stay at home and away from public gatherings including classes, university offices, dining halls, etc. Vaughn indicated that the Student Health Center has not seen any suspected cases of swine flu on campus and, during the height of the most recent flu season, there were only 10 flu cases over a two-week span. However, the health center staff is taking steps to ensure the center can handle any suspected cases of swine flu and it is coordinating with the local health department and the Office of Emergency Management. · Avoid close contact with people who are sick. · Stay home when you are sick. · Wash your hands often to help protect you from germs. · Avoid touching your eyes, nose, or mouth. · Get plenty of sleep, be physically active, manage stress, drink plenty of fluids, and eat nutritious food. Swine flu symptoms are similar to those of seasonal influenza and generally include fever, cough, sore throat, body aches, headache, chills, and fatigue. Some people with swine flu have also reported diarrhea and vomiting. Severe complications, such as pneumonia, sometimes occur and may be more likely in people with some underlying medical conditions. 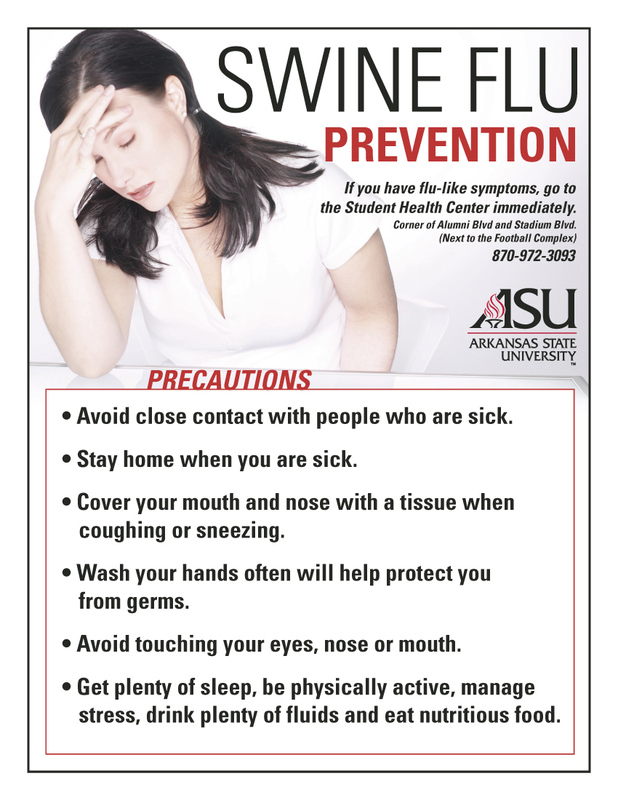 Arkansas State officials are communicating with faculty, staff, and students about swine flu precautions. Written advisories are also posted in ASU’s residence halls and around campus. Download a printable pdf file of the poster above.